Black Friday is the beginning of the shopping frenzy and if you’re one of the millions of Americans expected to hit the stores this Friday, Jim Wang shares some great money saving tips you don’t want to miss this holiday season. With the holiday season fast approaching, it is common to ramp up the spending. While many people enjoy the holidays, it can also be stressful, since holiday spending can put increased strain on your finances. One of the best things you can do in any financial situation is to make a list. Look ahead to what you will actually buy. From presents to decorations to special foods, consider your potential purchases. Make a list – and then stick to it. It can be very easy to buy on impulse during the holiday season. If you want to limit your impulse spending, a list can be a great way to do so. Plus, the list will help you quickly identify sale items. Once you have a list, you can begin planning your shopping patterns, and make purchases of items when you see them on sale. Compare your holiday shopping list with sales flyers and promotions. Don’t forget to look online for special pricing and sales. You’ll save money on your purchases and experience less stress for your bank account. You can offset some of your costs by using a rewards credit card for purchases. Some credit cards are even running special chances to earn extra points during this time of year. You might get bonus rewards for buying toys, or for making grocery purchases. Find out what promotions can help you maximize your rewards. You could get some of your holiday purchases for free when you are savvy about your credit card use. You will need a plan to pay off your purchases – especially if you are using a rewards credit card. The use of a rewards card shouldn’t be an excuse to spend more than you should. Instead, you should only spend what you had planned. Then, you should pay off the card as soon as possible. The best results are achieved if you pay off your credit card bill immediately, at the end of the billing cycle, so that you aren’t charged interest. If you do end up carrying a balance, make sure you have a plan to pay it off in no more than two months. High interest can offset the value of your rewards the longer you carry a balance. 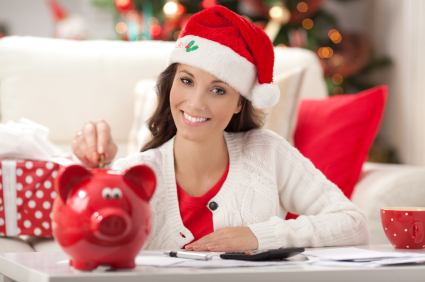 If you really want be ready for the holidays, use the entire year to prepare your finances. This can mean the least amount of stress for your budget during the holidays. If you decide to prepare from February to November, you will end up with 10 months to get ready. Set aside money each month, putting it in a high yield account that you use as your “holiday fund.” Use your spending this year as a guide. If you prepare all year, whether you set aside money or look for gifts to purchase throughout the year, you won’t have one big rush to spend during the holidays. Your budget will thank you.